Provides methods to build faces. From a surface and U,V values. Find the surface automatically if possible. From a surface and a wire. A flag Inside is given, when this flag is True the wire is oriented to bound a finite area on the surface. From a face and a wire. The new wire is a perforation. Load a face. Usefull to add wires. Make a face from a plane. Make a face from a cylinder. Make a face from a cone. Make a face from a sphere. Make a face from a torus. Make a face from a Surface. Accepts tolerance value (TolDegen) for resolution of degenerated edges. Find a surface from the wire and make a face. if <OnlyPlane> is true, the computed surface will be a plane. If it is not possible to find a plane, the flag NotDone will be set. Make a face from a plane and a wire. Make a face from a cylinder and a wire. Make a face from a cone and a wire. Make a face from a sphere and a wire. Make a face from a torus and a wire. Make a face from a Surface and a wire. Adds the wire <W> in the face <F> A general method to create a face is to give. The surface must not be a 'null handle'. If the surface is a trimmed surface, the basis surface is used. The parameter values must be in the parametric range of the surface (or the basis surface, if the surface is trimmed). If this condition is not satisfied, the face is not built, and the Error function will return BRepBuilderAPI_ParametersOutOfRange. The bounding parameters p1 and p2 are adjusted on a periodic surface in a given parametric direction by adding or subtracting the period to obtain p1 in the parametric range of the surface and such p2, that p2 - p1 <= Period, where Period is the period of the surface in this parametric direction. A parameter value may be infinite. There will be no edge and no vertex in the corresponding direction. Adds the wire W to the constructed face as a hole. Warning W must not cross the other bounds of the face, and all the bounds must define only one area on the surface. (Be careful, however, as this is not checked.) Example // a cylinder gp_Cylinder C = ..; // a wire TopoDS_Wire W = ...; BRepBuilderAPI_MakeFace MF(C); MF.Add(W); TopoDS_Face F = MF;. 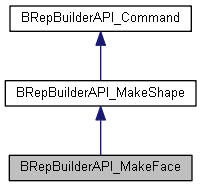 Returns the construction status BRepBuilderAPI_FaceDone if the face is built, or. another value of the BRepBuilderAPI_FaceError enumeration indicating why the construction failed, in particular when the given parameters are outside the bounds of the surface. Returns the constructed face. Exceptions StdFail_NotDone if no face is built. Initializes (or reinitializes) the construction of a face by creating a new object which is a copy of the face F, in order to add wires to it, using the function Add. Note: this complete copy of the geometry is only required if you want to work on the geometries of the two faces independently. Initializes (or reinitializes) the construction of a face on the surface S. If Bound is true, a wire is automatically created from the natural bounds of the surface S and added to the face in order to bound it. If Bound is false, no wire is added. This option is used when real bounds are known. These will be added to the face after this initialization, using the function Add. TolDegen parameter is used for resolution of degenerated edges if calculation of natural bounds is turned on. BRepBuilderAPI_ParametersOutOfRange when the parameters given are outside the bounds of the surface or the basis surface of a trimmed surface. TolDegen parameter is used for resolution of degenerated edges. Returns true if this algorithm has a valid face.